Julia Ducournau’s RAW (aka GRAVE) is a stunningly artistic take on modern cannibalism, neatly wrapped up as a coming-of-age story. I was lucky enough to review some great indie horror movies in 2017, but one of the standouts has to be Raw (Grave in its original French language). Refreshingly for this genre we love, it has a female director to look out for in French filmmaker Julia Ducournau — delivering her debut feature in such a shocking and artistic manner, that you’d assume she’s headed for the big time. While by no means low budget (it cost an estimated €3.5m/$4.2 million), it makes no bones about the fact that it’s not shackled by the requirements of delivering to a mainstream audience. 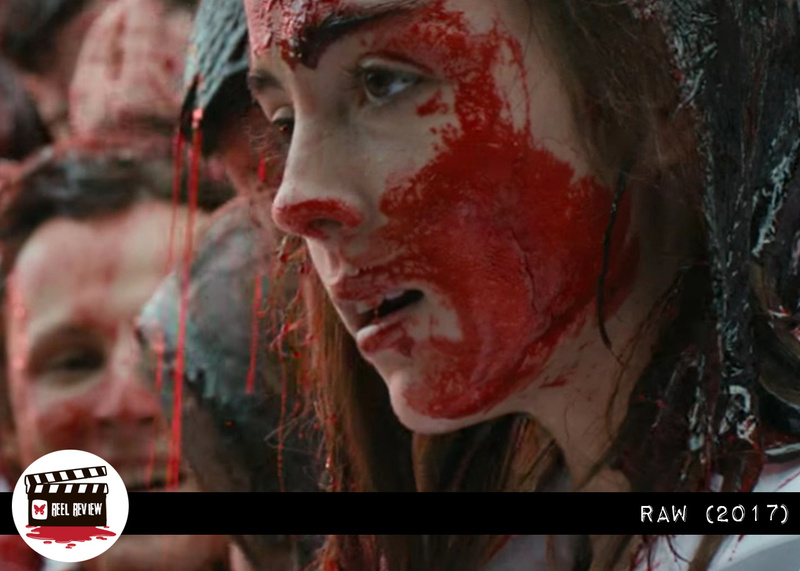 Raw positively revels in the artistic integrity of the director, who combines an at times difficult to watch cannibal movie with a complex portrait of Justine (Garance Marillier), a young girl facing her first few weeks away from home at university. Marillier’s performance is really quite extraordinary – her facial expressions alone convey every emotion possible within the film’s 99 minute run time. For those of you who might usually be put off by a foreign language film, I can assure you, I count myself amongst you on the whole. But the visceral landscape of the film floats dreamily through your mind, and after the first few minutes you’re likely to forget that you’re having to read subtitles too. Justine starts out a vegetarian, being driven to her first experience of adult life at veterinarian school by her (also vegetarian) parents, who appear to be quite disconnected. They stop at a service station en route, and Justine unknowingly finds herself with a mouthful of sausage, hidden amongst her mashed potato. Her disgust, and that of her mother, makes evident early on how she feels about consuming meat. But it also seemingly triggers something within her that she’s never experienced before. As an allegory for entering adult life, it works perfectly. And her desire to consume flesh spirals out of control by the middle of the film, leading to a climactic final act in which she sheds all of her inhibitions. Once at her bleak looking and isolated new school, Justine is reunited with her older sister Alex (Ella Rumpf). She is also forced into disgusting initiation rituals, one of which includes eating a raw rabbit kidney. She subsequently falls ill. This unsettling event becomes the catalyst for what follows. Although they have a close relationship, Alex is also something of a bully towards Justine and is a thoroughly unlikeable character. At one turn, she appears to be looking out for Justine. At other times, she reverts to being part of the “in-crowd” and tormenting her sister, while positively reveling in her disquiet. The dynamic doesn’t quite ring true to me, but perhaps that’s because I don’t have any siblings. Regardless, it simply added to the unsettling atmosphere created by Ducournau throughout. As the film progresses, Justine’s desire to consume human flesh grows. Combined with a new found confidence in other areas of her life (note how she somehow convinces her gay male roommate to sleep with her, which again doesn’t quite ring true), she begins to actively seek ways to fulfill her desires. Ducournau takes some sizable but calculated risks with the second act which up the artistic levels without ever impeding the story or hindering the pace, and they elevate the film to a place where I didn’t expect it to go to given the apparent subject matter. She never forgets that the story is pure metaphor, and she apparently enjoys reinforcing this to the audience whenever possible. While the “reveal” at the end of the film is extremely disappointing (and as obvious as it is unnecessary in my opinion), it doesn’t spoil what is a truly excellent entry into the cannibalism sub-genre — one which will both surprise you and hopefully delight you in the same way it did me. Raw is definitely worth your time. And, considering how many awards Ducournau has received for this film, it comes highly recommended by many more audiences and juries other than me. So seek it out when you can (the film is currently available on Netflix), and keep a close eye out for the director’s next film. Want a second opinion? Click here for an alternate take on Raw.